Your knee is a complex capsule which acts as sort of hinge. capsule, any swelling in the knee affects both joints. The femur [thigh bone] is the largest bone in your body. The tibia [shin bone] is the larger bone of the lower leg. The fibula is the smaller bone in the lower leg, sitting on the outside of the tibia. The patella [knee cap] is located in front of the femur and tibia and slides within its own groove on the femur as the knee moves. Ligaments connect the bones of the upper and lower leg and are made of strong groups of fibres that help to provide stability to your knee. 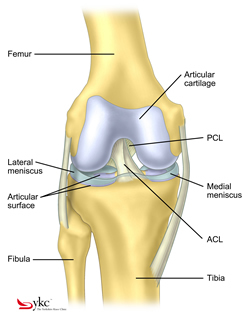 There are two main groups of knee ligaments. They allow the joint to move, but they also prevent the joint from moving excessively or abnormally. 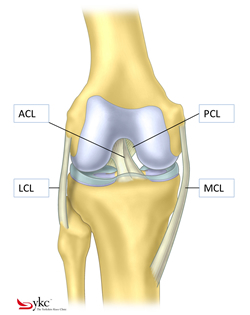 The medial and lateral collateral ligaments [MCL and LCL] lie on the inner and outer sides of the knee respectively. They help to prevent sideways motion. The anterior cruciate ligament [ACL] and posterior cruciate ligament [PCL] lie in the centre of the knee crossing each other (hence “cruciate”). The ACL helps to limit rotation and forward motion of the tibia whilst the PCL located just behind the ACL limits the backward motion of the tibia. In addition, there is a complex area called the posterolateral corner (PLC), which is made up of a group of linked ligaments, tendons and capsular fibres that assist in rotational (twisting) stability. The quadriceps [‘quads’] are four muscles in front of the thigh that act to straighten the knee. The hamstrings are the muscles in the back of the thigh that work together to bend the knee. Tendons are structures that attach muscles to bones. 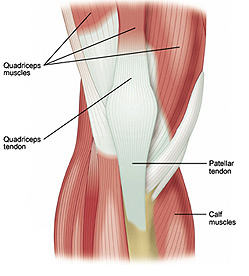 The four quadriceps form into one tendon called ‘the quadriceps tendon’ which surrounds the patella and then becomes the patellar tendon as it attaches to the tibia below the knee. 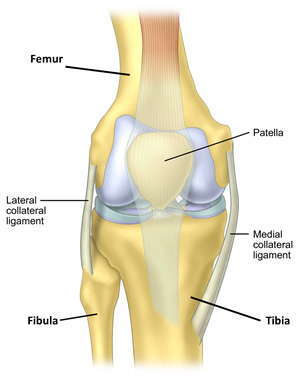 The ends of each bone in your knee are covered with smooth articular (joint surface) cartilage. This reduces friction between the moving surfaces of the knee joint and helps to spread the loads that are applied to the joint. Between the femur and the tibia are two ‘C’ shaped wedges called menisci. These sit on either side of the joint, and act as shock absorbing cushions between the two main bones, in addition to other functions. When a meniscus is damaged, it is often referred to as a ‘torn cartilage’. This can be a confusing term, but when people talk about a torn cartilage, they usually mean the meniscus and not the articular cartilage.